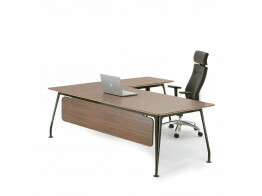 Apres supply a large selection of prestigious executive office desks and executive furniture finished in either glass, laminate, high gloss lacquer, matt lacquer, steel, leather or wood veneer. Our modern executive office desks range offer a high quality of craftsmanship finished solutions from the leading British furniture manufacturers and Europe. We at Apres offer a complete executive office furniture package, you can purchase a whole cellular office solution or just a desk. Contact Apres to help you in finding the right executive office desk or furniture solution in the finish and combination you want. 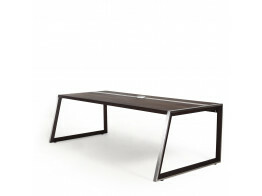 Rego Executive Desk is a elegant wooden executive office furniture desk. 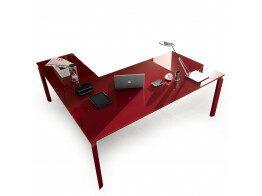 Kyo Light Desk is a management office desk solution with comlimenting sotrage. Anyware Executive Desk is a systems offering desk storage and desk returns. Vektor Executive Desk with integrated suspended storage system. P80 Manager Desk is high-end office desk system for executives with an unusual yet effective design.